After its rich culture and even richer food, one of the best things about visiting Italy is shopping. From high-end fashion and design to exquisite artisan wares, Italy is full of unique treasures that are a both a refreshing change from chain store anonymity and imbued with a history and tradition often dating back centuries. We have talked about some of our favorite artisan souvenirs in the past, but have never mentioned one of Italy's most affordable (and packable) traditional crafts: paper. Italy was, after Spain, where papermaking in Europe began. The technique was introduced to the Iberian peninsula by Arabs who had picked it up along the Silk Road as it traveled from China, where the world's first paper was produced sometime around the 2nd century AD. After being established in Spain and Portugal in the 11th century, papermaking spread to Sicily and then to mainland Italy by the 1200's. 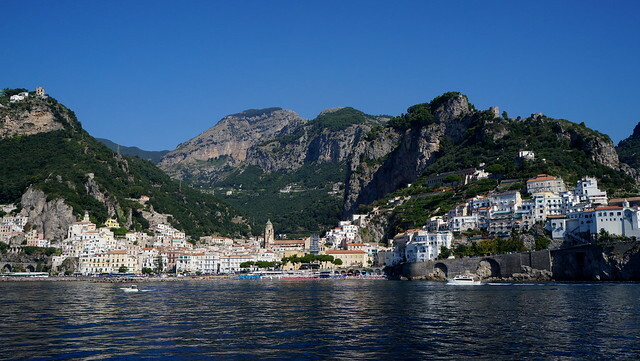 The Republic of Amalfi, one of the most powerful sea republics in the Middle Ages, was one of the first places on the Italian peninsula to come into contact with papermaking, and with the Canneto River bubbling down the mountain slopes right through town to the sea and the bustling port ready to export goods, a thriving paper-making industry was quickly established there in the first half of the 12th century. As opposed to Chinese and Arab paper manufacturing, in which the wood and cotton rag pulp was pounded manually with hand pestles, Europe introduced innovative water-powered mills, which mechanized the pounding process with the use of trip-hammers. 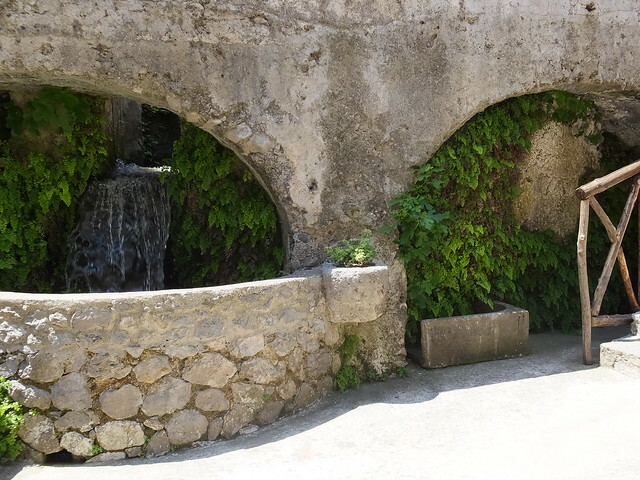 At the height of production, which lasted until the mid-1800's, the river gorge up the slope behind Amalfi known as the Valle dei Mulini, or Valley of the Mills, was home to more than a dozen mills, all of which were abandoned when the industrial revolution made their Medieval technology obsolete. 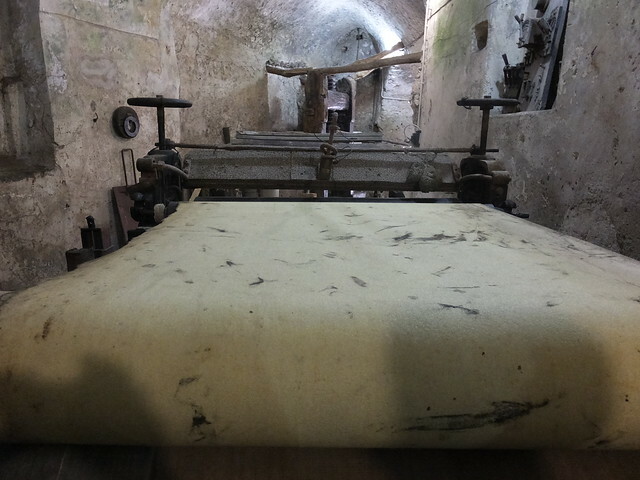 Today, the only paper mill still in operation is the historic Amatruda Cartiera, where the Amatruda family has been making paper since the 15th century and continues to craft luxuriously thick cotton watermarked sheets for anything from royal wedding invitations to personal stationary. 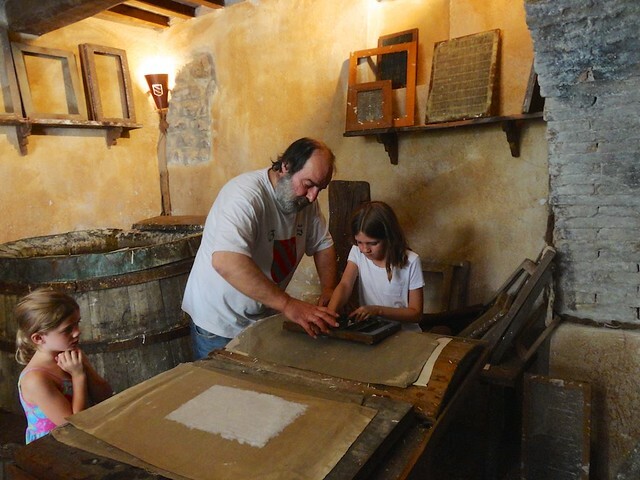 For a glimpse at the history of papermaking in Amalfi, the Museo della Carta is an interesting stop. Located in a 13th-century paper mill, the Paper Museum offers guided tours in English which explain the history of papermaking in Amalfi over the centuries, the mill machines and tools, and a demonstration of how a sheet of paper was produced with pulp in an original majolica tile-lined vat. The gift shop is a treasure trove of locally made leather-bound notebooks, flower-pressed writing paper, sketchpads, and stationary sets. Papermaking spread quickly in Italy, and from the coastal trading center of Amalfi traveled to the unlikely mountain town of Fabriano in Le Marche. 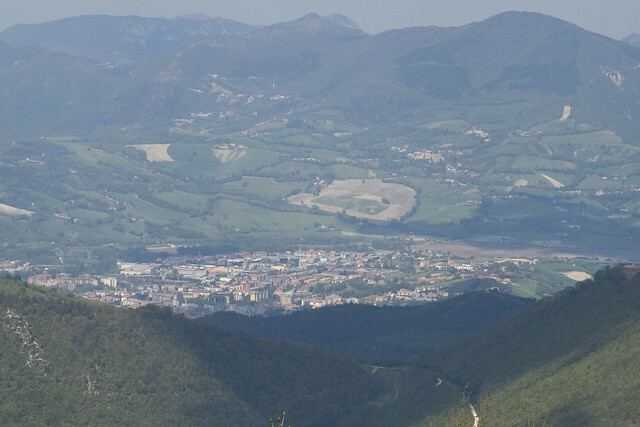 Though the town itself is located inland, its relative proximity to the important port town of Ancona was probably why Fabriano quickly became one of the earliest places in Europe to make paper on a large scale, starting in the 13th century. Whereas Amalfi's paper production has almost completely disappeared, Fabriano continues to produce both industrial and high quality watermarked paper almost 800 years later. So important is the history of papermaking in Fabriano that in 2013 it joined Bologna and Torino as Italy's third city to be named a Creative City by UNESCO for craft, arts, and popular traditions. Though the Renaissance marked the peak of Fabriano's paper production (Michelangelo used this paper for both his drawings and correspondence, as did many of the great artists of that age), the city was able to weather the decline during the 1700's by introducing production on an industrial scale that remained competitive internationally. Like Amalfi, Fabriano has an excellent and fascinating paper museum, which takes visitors through the history of both the techniques and innovations of local papermaking, and also offers classes and workshops in papermaking, printing, and marbling. If you can't make it to Fabriano, you can still purchase their ubiquitous fine art papers at virtually any art supply or stationary store in Italy. Like papermaking, the art of paper marbling traveled from China through the Middle East, eventually arriving in Europe in the 17th century. Though this method of decorating paper by floating color on water and then transferring the marble-like pattern onto absorbent paper was adopted across Europe, Florentine bookbinders using their one-of-a-kind papers for covers and endpapers became particularly known for their skill and artistry. 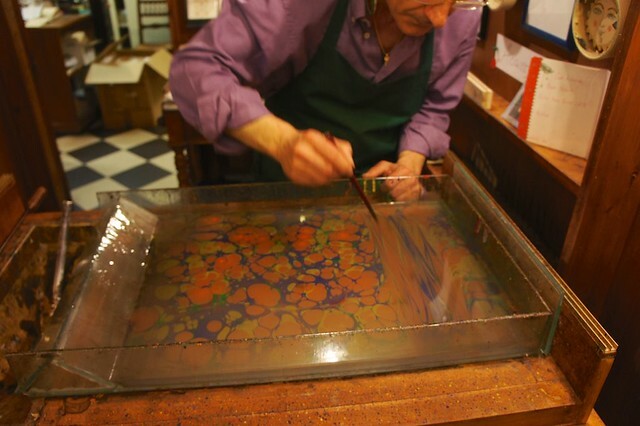 As the craft slowly died out in other parts of Europe, paper marbling become steadily more centered on Florence and the city is now one of the few places where there are still artisan workshops producing handmade marbled paper. 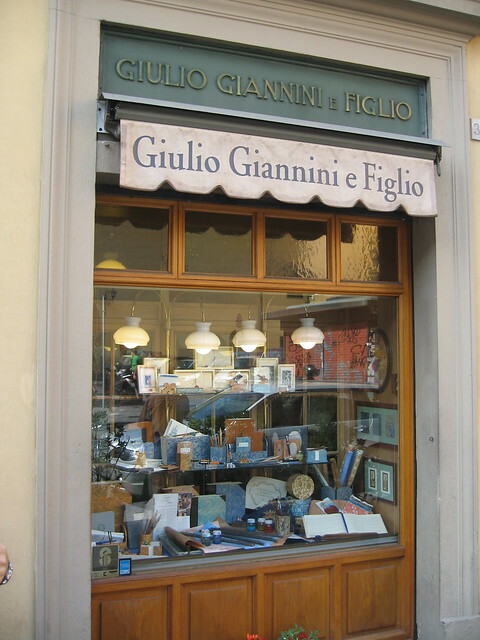 One of the best known of the Florentine paper shops is Giulio Giannini e Figlio, across from the Pitti Palace. The shop opened in 1856 as a bookbinder, but after the turn of the century the family began concentrating primarily on paper marbling and is today considered among the greatest masters. Aside from their lovely paper-covered albums, journals, boxes, and pencils, the shop also organizes classes and workshops for anyone interested in learning this traditional art. Two other gorgeous atelier-shops are Alberto Cozzi on Via del Parione and Zecchi on Via Dello Studio. 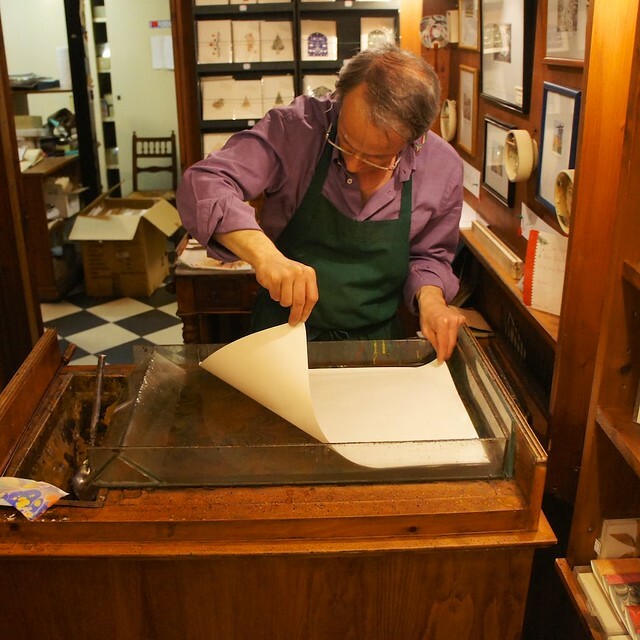 Alberto Cozzi sells marbled papers, paper-covered decorative items, and stationery all made with sheets decorated right there in the shop. Zecchi is a lovely art supply store that has a small selection of reasonably priced paper alongside its wonderful collection of art supplies. Another source for handmade paper and paper products is Il Papiro, which has several locations in Florence and other Italian cities. This delightful village (one of our favorites) in Umbria doesn't have a history of papermaking, but it does have an excellent Medieval festival each year in June called Il Mercato delle Gaite. 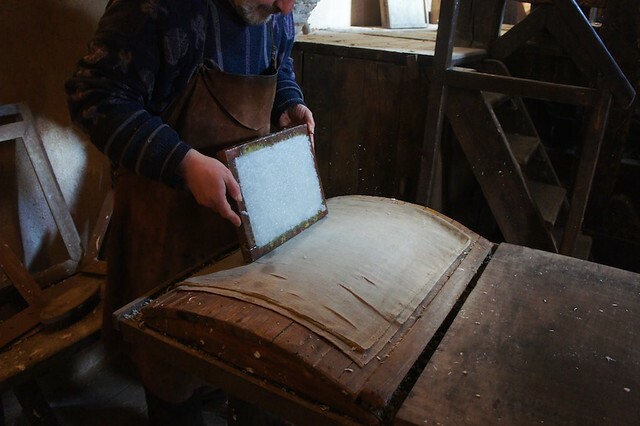 As part of the festival, the town has recreated a number of historically accurate workshops using technology dating from the Middle Ages, including a water-driven paper mill. The mill is one of the few workshops kept open for visitors all year round, so even if you can't make it for the festival, take a few hours to visit this lovely town and its fascinating historic paper mill.